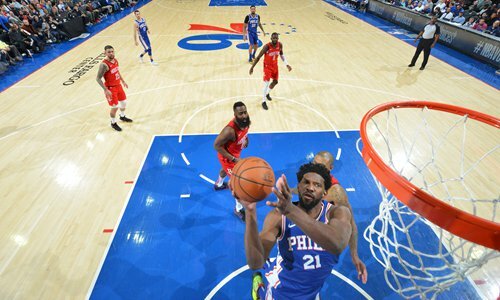 Philadelphia big man Joel Embiid scored 32 points and grabbed 14 rebounds Monday as the 76ers withstood a 37-point performance from James Harden in a 121-93 victory over the Houston Rockets. Embiid added two assists, two steals and three blocked shots, provoking the ire of Harden in the ­final minute of the first half when he leaned in to guard the reigning NBA Most Valuable Player as he drove toward the basket. Philadelphia outscored the Rockets 29-13 in the third period pushing their lead to as many as 31 points. With the game out of reach, Harden sat out a fourth quarter that saw both teams' starters mostly on the bench. "We stayed to one philosophy and that's moving the ball, sharing the ball, playing together," Embiid said of how the 76ers dominated despite the absence of Jimmy Butler. "I think we did that pretty well tonight." In New York, Oklahoma City's Paul George scored 31 points while Russell Westbrook added 17 points, 10 rebounds and nine assists as the Thunder routed the Knicks 127-109. Germany's Dennis Schroder ­added 17 points off the bench while Jerami Grant and reserve Abdel ­Nader each contributed 16 points for Oklahoma City (28-18) in the Martin Luther King Jr holiday romp. "This is my first time playing on Martin Luther King Jr Day. It's an honor to play on the holiday, a great honor," George said. The Thunder, third in the Western Conference behind defending NBA champions Golden State and Denver, are keeping a focus on the playoffs even as they take care of business during the season. Tim Hardaway Jr led the Knicks (10-36) with 23 points, but New York's losing streak stretched to six games. Slovenian rookie Luka Doncic led Dallas with 18 points, 11 rebounds and 10 assists - the first triple-double of his NBA career. The 19-year-old joined 76ers guard Markelle Fultz as the only teenagers ever to post triple-doubles - scoring in double figures in three key statistical categories - but didn't feel much like celebrating. Elsewhere, Trevor Ariza scored 20 points and Otto Porter added 19 off the bench to lead seven Washington players in double figures in the Wizards' 101-87 home triumph over Detroit. D'Angelo Russell scored 31 points and handed out eight assists to lead the Brooklyn Nets to a 123-94 victory over the Sacramento Kings.